The Cauvery dispute is developing itself into a bigger legal crisis – not just a “lis” between Karnataka and Tamil Nadu, but into an in-depth constitutional crisis. The debate over sharing Cauvery water predates to the late British era (1890s), wherein the Mysore princely state and the Chennai presidency (which was under the British Raj) had to come into terms with agreeing on a divide. The contention really arose when, in 1910, both states started devising plans for construction of dams. The British arbitrated the issue and defined the respective shares of water, and as to what area of farming lands are to be supported by these. Over the past two decades, the Supreme Court of India and the Cauvery River Authority (a powerful body that was established to reach consensus on this matter) had intervened on several occasions to have the states agree on water sharing and we have seen highly dramatic situations at many times. 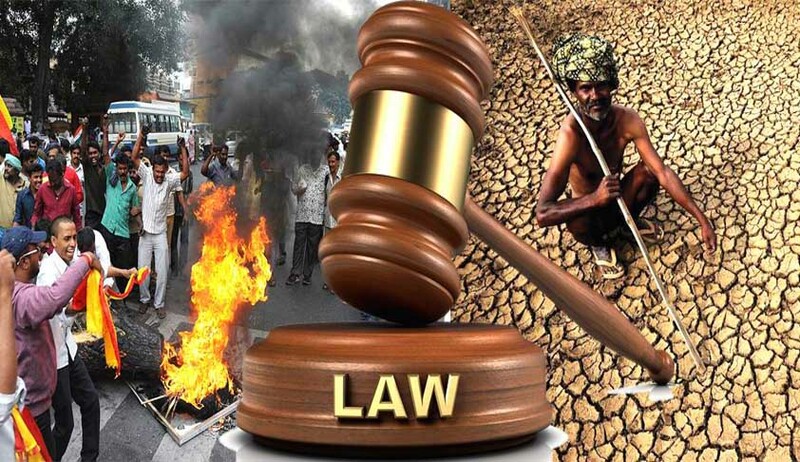 The present crisis originated when the Supreme Court of India by an interim order on 5th September 2016, directed Karnataka to release 15,000 cusecs of Cauvery water per day to Tamil Nadu for the next 10 days to ameliorate the plight of the farmers there. Violent riots broke out in Karnataka against the people of Tamil Nadu protesting against the said order. Protests also broke up in Tamil Nadu against Karnataka in retaliation. The riots turned violent, leaving many people dead and seriously injured and hundreds of vehicles and property damaged in both States. Subsequently, on a motion by Karnataka, the Supreme Court modified its earlier order and directed Karnataka to release 12,000 cusecs on a daily basis till 20 September. The Supreme Court while passing the above order also mentioned, “Agitation, spontaneity or galvanised riot or any kind of catalyst component can never form the foundation for seeking modification of an order... an order of this court has to be complied by all the concerned and it is the obligation of the executive to ensure that the orders are complied in letter and spirit”. The Supreme Court also agreed to urgently hear a petition seeking a judicial direction to the governments of Karnataka and Tamil Nadu to “control” and act against the fringe elements which orchestrated violence in both States following the apex court order to release Cauvery water. Emotion continued to run high and protests and riots continued. Following an all-party meeting, the Karnataka government decided not to implement the Supreme Court’s directive to release Cauvery water to Tamil Nadu till September 23 and a special session of the state legislative assembly was convened to make a decision on the issue and a resolution was passed affirming the said decision. This could be seen as contempt of the Supreme Court and a Constitutional crisis. Even though there are many issues arising out of this situation, I would like to focus on two issues. First – the issue of power supremacy between the judiciary and the legislature and second – the question whether all disputes could be finally resolved by adjudication? Now a situation has come where the Supreme Court has given a direction to the Karnataka government and the government has decided not to comply with the said direction and added to that the Karnataka legislative assembly has unanimously resolved not to abide by the direction. This is not the first time that Karnataka has taken this extreme step. In 2002 also, the then Chief Minister of Karnataka refused to comply with the Supreme Court order to release water to Tamil Nadu, but had to later abide by the apex court ruling for potentially facing the charge of contempt of court. And this is not just confined to one State! In March this year, the Punjab government, in defiance to Supreme Court, passed a resolution against Sutlej-Yamuna Link Canal construction. The matter is now pending in the Supreme Court. It is said that those who cannot remember the past are condemned to repeat it and those who do not learn from history are doomed to repeat it! About 52 years back we had faced a similar situation of legislature-judiciary confrontation. It would be worthwhile to recollect that case. On 14th March, 1964, the Speaker of the Legislative Assembly of Uttar Pradesh administered a reprimand to one Keshav Singh for having committed contempt of the House. Keshav Singh approached the Lucknow Bench of the Allahabad High Court against the said order and the High Court passed an order that the applicant should be released on bail. Instead of complying with the order, the Assembly proceeded to take action against the two Judges who passed the order, as well as Keshav Singh and his Advocate. The Assembly proceeded to pass a resolution on 21st March, 1964, stating that the two Judges have committed contempt of the House and therefore ordered that Keshav Singh should immediately be taken into custody and kept confined in the District Jail Lucknow for the remaining term of his imprisonment and the two Judges should be brought in custody before the House. The two learned Judges heard about this resolution on the Radio in the evening of 21st March and read about it in the morning edition of the Newspaper and they rushed to the Allahabad High Court with separate petitions under Art. 226 of the Constitution. Apprehending that these developments had given rise to a very serious problem, a Full Bench of the Allahabad High Court consisting of 28 Judges of the said High Court took up on the same day the petitions presented before them by their two colleagues at Lucknow, directed that the said petitions should be admitted and ordered the issue of notices against the respondents restraining the Speaker from issuing the warrant in pursuance of the direction of the House given to him on the 21st March, 1964, and from securing execution of the warrant if already issued, and restraining the Government of U. P. and the Marshal of the House from executing the said warrant. Meanwhile, on 25th March, 1964, Keshav Singh presented a similar petition to the High Court under Art. 226, praying for a writ of mandamus on the same lines as the petitions filed by the two Judges, and he urged that suitable order should be passed against the House, because it had committed contempt of Court. This application again was heard by a Full Bench of 28 Judges of the Allahabad High Court on 25th March, and after admitting the petition, an interim order was passed prohibiting the implementation of the resolution the validity of which was challenged by the petitioner. On the same day, the House passed a clarificatory resolution, whereby the warrants issued for the arrest of the two Judges and the lawyer were withdrawn, with the result that they were placed under an obligation to appear before the House and offer their explanations as to why the House should not proceed against them for their alleged contempt of the House. When the incidents which happened in such quick succession from the 19th to the 25th March, 1964, had reached this stage, the President of India decided to exercise his power to make a reference to the Supreme Court under Art. 143(1) of the Constitution on the 26th March, 1964. The order of reference shows that it appeared to the President that the incidents in question had given rise to a serious conflict between a High Court and a State Legislature which involved important and complicated questions of law regarding the powers and jurisdiction of the High Court and its Judges in relation to the State Legislature and its officers and regarding the powers, privileges and immunities of the State Legislature and its members in relation to the High Court and its Judges in the discharge of their duties. The matter was heard by a 7-judge bench of the Supreme Court headed by Chief Justice P.B. Gajendragadkar. The others on the bench were Justices A.K. Sarkar, K. Subba Rao, K.N. Wanchoo, M. Hidayatullah, J.C. Shah and N. Rajagopala Ayyangar. The court held that the Constitution is supreme and Indian legislatures cannot claim sovereignty similar to the Parliament in England. It declared that the judiciary has the exclusive power to interpret Article 194(3) from which legislatures draw their powers and privileges and that legislatures must use their plenary powers with circumspection. The court said “state legislatures in India could not by virtue of Art 194(3) claim to be the sole judges of their powers and privileges to the exclusion of the courts. Their powers and privileges were to be found in Art 194(3) alone and nowhere else, and the power to interpret that Article lay under the scheme of the Indian Constitution, exclusively with the judiciary of this country”. The court held that in a democratic country governed by a written Constitution, It is the Constitution which is supreme and sovereign. It is no doubt true that the Constitution itself can be amended by the Parliament, but that is possible because Article 368 of the Constitution itself makes a provision in that behalf, and the amendment of the Constitution can be validly made only by following the procedure prescribed by the said Article. That shows that even when the Parliament purports to amend the Constitution, it has to comply with the relevant mandate of the Constitution itself. Since the Constitution assigns to the Judiciary the function of authoritatively and finally interpreting the Constitution and of expounding its meaning, the supremacy of the Constitution, interpreted finally by the courts, is one of the ways in which harmonious working of the Constitution is secured, and the so-called "dualism", which must give rise to constitutional conflict, is avoided. When there is no dispute that the Constitution is supreme, then the following consequences has to flow from the supremacy of the Constitution. That all the organs of State are subordinate to the Rule of Law contained in the Constitution. No person or authority or organ of State can claim to be above the law or to flout the law contained in it. They are all equally subjected to it. That the object of judicial function is not to destroy but to safeguard and fortify the frontiers of each orbit and to affirm, reinforce and support every just and correct exercise of powers within each orbit. We need to understand that the fundamental principles on which an orderly and civilized Government rests is broadly covered by the term "Rule of Law", and the same is laid down for us in our Constitution. There can be little doubt that the successful working of the rule of law is the basic foundation of the democratic way of life. In this connection it is necessary to remember that the status, dignity and importance of these two respective institutions – the Legislatures and the Judicature, are derived primarily from the status, dignity and importance of the respective causes that are assigned to them by the Constitution. The Legislators, Ministers and Judges - all of them take oaths of allegiance to the Constitution, for it is by the relevant provisions of the Constitution that they derive their authority and jurisdiction and it is to the provisions of the Constitution that they owe allegiance. Only when these two bodies function rationally, harmoniously and in a spirit of understanding within their respective spheres, there could be a peaceful development, growth and stabilisation of the democratic way of life in this country. In this context, it is worthy to remember the words of Lord Atkin: “Wise Judges never forget that the best way to sustain the dignity and status of their office is to deserve respect from the public at large by the quality of their judgments, the fearlessness, fairness and objectivity of their approach, and by the restraint, dignity and decorum which they observe in their judicial conduct”. What is true of the Judiciary is equally true of the Legislature. Even though the Supreme Court in the reference in Keshav Singh case had held that the power to interpret an Article under the scheme of the Indian Constitution, lie exclusively with the judiciary and the legislature is bound by the said interpretation, in the background of today’s situation, it would be worthwhile to learn from the words of Justice A.K. Sarkar, who had given a dissent opinion in the above reference. He said, “With a little more tact, restraint and consideration for others, the situation that has arisen could have been avoided. In a modern State it is often necessary for the good of the country that parallel powers should exist in different authorities. It is not inevitable that such powers will clash. It would be defeatism to take the view that in our country men would not be available to work these powers smoothly and in the best interests of the people and without producing friction. I sincerely hope that what has happened will never happen again and our Constitution will be worked by the different organs of the State amicably, wisely, courageously, and in the spirit in which the makers of the Constitution expected them to act”. Now, we will look at the second question whether all disputes could be finally resolved by adjudication? In the present case, decision was taken by the Karnataka government and the resolution was passed by the Karnataka Assembly after carefully considering the needs of the inhabitants of the state of Karnataka whose interests are likely to be jeopardized. They found that in a distress year with scanty rainfall, the release of water for crops in Tamil Nadu would mean no drinking water for people in Karnataka. So the decision of the Supreme Court to release water to Tamil Nadu was not justifiable according to Karnataka! Similarly, Tamil Nadu had to get water immediately to save its samba paddy crop and ameliorate the plight of the farmers there. The decision of Karnataka government not to release water in spite of a court order was not justifiable according to Tamil Nadu! For lawyers and constitutional experts this would be a case of clear defiance of the Supreme Court order amounting to civil contempt or a move by the government to project the decision as a legislature-judiciary confrontation. And they could wait and watch the outcome and take this as a new case study. But when we look at the plight of the common man aggrieved by the situation, it is a matter of life and death. It is relevant to speak of “Rule of law” only if the dispute concerns legally enforceable rights and duties and only if the parties to the dispute wish or are required to have their dispute determined in accordance with those rights and duties. Not all disputes concern legal rights and duties and not all disputes about legal rights and duties must be resolved by reference to those rights and duties. There is something called “niti” and “nyaya” and some disputes have to be resolved on “niti” and some based on “nyaya”. We need to understand that laws are made for the wellbeing and welfare of the people and not vice versa. The rule of law can be understood from the viewpoint of the individual and by reference only to the relationship which the individual has with others in society. It is important to distinguish disputes which manifests itself in distinct justiciable issue based on recognized legal rights between the petitioner and the respondent and disputes where large communities are involved affecting their own livelihoods and the resources on which those livelihoods are based. Viewed from this vantage point, an adjudication based on “nyaya” may not be seen as “niti” by a group of people and the same becomes unacceptable. The dynamics of a dispute are often compared to an iceberg – only a fraction of the issues in a dispute are immediately accessible. The submerged part of the iceberg represents the fundamental underlying factors contributing to any given dispute, which do not always surface during formal rights-based processes like in a litigation or arbitration. These processes focus on the positions and issues of the parties illustrated at the tip of the iceberg and tend to narrow issues, streamline legal arguments and predict judicial outcomes or render decisions based on assessments of fact and law, which may not render “justice” or “niti” to many, resulting in non-compliance or disobedience of the judgments. It will be difficult in such cases for the Courts to execute such judgments and for the government to control such agitations. Here the Rule of law has to focus upon preventive, facilitative and advisory dispute resolution processes, which could explore beneath the surface of the iceberg and can be described as interest based resolution, which would satisfy the needs of the parties on both sides, rather than imposing a decision based on legal rights. The present issue has not been resolved yet. Borrowing the words of Justice A.K. Sarkar, I wish that instead of harping on the nuances of power supremacy, our legislators and judges would work these powers smoothly and in the best interests of the people and without producing friction, and in the spirit in which the makers of the Constitution expected them to act.